To Balder on the "Ships starting with B" page. Built at Trondhjems mek. Verksted, Trondhjem (91), delivered in March-1901 as Balder to Johan Chr. Gjertsen, Bergen, 703 net, 1600 tdwt, 231.4' x 34.4' x 13.6', Triple exp. (builders), 124 nhp. Owned from Aug. 17-1906 by Johan C. Giertsens Eftf. e.a., Bergen, then from Nov. 14-1915 by D/S A/S Balder (Schjelderup & Schjøtt), Bergen. Albert Schjelderup, Bergen became managers on June 8-1917. (Compare with the history information found on this external page). Errors do exist (this could also mean that she may not have sailed in all the convoys mentioned here). Also, several voyages are missing. The last 2 entries above may simply mean that she was scheduled for FS 158, but did not sail, or returned to port, then joined the next convoy, FS 159. See also Page 1. May 19 Southend Portsmouth May 20 OA 151 Compare w/Page 1. Again, these last 2 entries may mean she was scheduled for FS 219, but did not sail, or returned to port, then joined the next convoy. It'll be noticed, when going to Page 1, that these movements are not included. July 14 Southend Dover July 14 CW 5 Not included, Page 1. Bombed, towed to Dover for repairs. July 25 Dover Portsmouth July 26 CW 8 Convoy available at link above. It looks like she did not sail in FS 346 (or returned to port), and instead joined the next convoy. See also Page 2. Apr. 11 Blyth Southend Apr. 13 FS 461 See also Page 2. July 15 Southend Kirkwall July 18 EC 46 Not included, Page 3. Straggled, passed Dunnet Head Nov. 12. March 7 Holyhead Milford Haven* March 8 BB 146 *Compare w/Page 4. * Departure date June 20 is incorrect - Convoy PW 179 left Portsmouth on June 30 - therefore, this voyage has been inserted at * below. Also, CW 96 left Southend for St. Helens Roads on June 21. CE 97 left St. Helens Roads for Southend on June 27, in other words, it sailed in the other direction. So, convoy should be CE 94 (instead of CW 96) - left Cowes for Southend on June 21, arrived next day. And the next convoy should be CW 99 (instead of CE 97) - left Southend on June 27, arrived St. Helens Roads next day. * June 30 Cowes Roads Plymouth July 1 PW 179 Ref. convoy link above. (Page 5 & Page 6). July 5 Falmouth Swansea July 6 PW 181 Compare w/Page 6. Aug. 1 Southampton Milford Haven Aug. 3 PW 195 Compare w/Page 6. * Convoy PW 362 left Portsmouth on June 30, arrived Milford Haven July 2. The departure date given for Cowes above is probably incorrect, and should be June 30 - therefore, I've inserted this voyage at * below. Jan. 11 Fell out of PW 459 Stranraer Jan. 19  In tow. 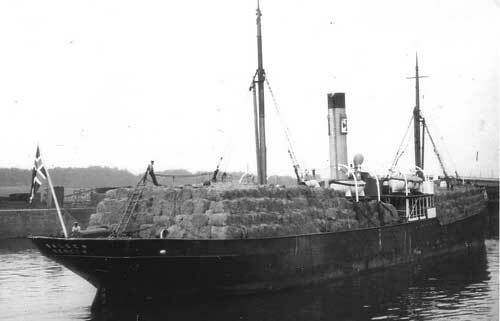 Balder is listed in Convoy HN 11 from Norway to the U.K. in Febr.-1940, bound for Methil in ballast. Later that month A. Hague has included her in the U.K.-Norway Convoy ON 16, and at the end of March-1940, shortly before the German invasion of Norway, we find her in Convoy HN 22, bound for Tyne in ballast, thereby ending up in allied service. According to Page 1 of the archive documents, she arrived Shields on March 31 (remaining there for a month), having started out from Bergen on the 26th. She was subsequently in service around the U.K. In May-1940 she's listed in Convoy OA 141, which left Southend on May 3 and dispersed on the 6th; Balder had arrived Portsmouth on the 4th. The Norwegian Hjalmar Wessel is also included. Balder shows up again in Convoy OA 151, which left Southend on May 19 (dispersed May 22). She was again bound for Portsmouth, where she arrived on May 20 - please see the external links provided within the table above. In June that same year, Arnold Hague has her in Convoy OA 169, which left Southend on June 17 and was dispersed 2 days later. Her destination is again given as Portsmouth, where she arrived on June 18 (according to A. Hague). There seems to be some disagreement as to whether this was the Icelandic Baldur, or the Norwegian Balder. As will be seen, when going back to Page 1 of the archive documents, she did leave Southend on June 17 and was bound for Portsmouth - arrival not given. This convoy was composed of 2 parts, OA 169(1) and OA 169(2), Balder (or Baldur) being in station 66 of Part 2, which had several Norwegian ships, namely Gulhaug, Lom, Roy, Røyksund, Thorøy and Varegg, while Vinland is included in Part 1- see the external website that I've linked to at the end of this page, as well as link to A. Hague's listing in the Voyage Record above. Balder was 2 miles south of Dover in Convoy CW 5 on July 14-1940 when attacked by two aircraft, hit aft by a bomb and set ablaze. The 4* on gun duty were killed, but had managed to hit one of the planes. 14 survivors, 2 of whom were injured, were picked up from a lifeboat by the Norwegian MTB 5 (Ø. Schau) under continuous air attacks (10 aircraft were involved), then landed in Dover where the wounded were given medical treatment. The Norwegian Ara is also listed in Convoy CW 5, as will be seen when following the link in the table above. * Steward Thorstein Kristoffersen, Ordinary Seaman Lars Martinus Lorentzen, 1st Mate Kristian Jensenius Skjervik, and 2nd Engineer Petter Severin J. Solberg are commemorated at the memorial for seamen in Stavern, Norway. To find them, go to this external page, then enter each name in the search field for "Personer". I've been told by a visitor to my website that according to British records Balder was on a voyage from South Shields to Portsmouth with a cargo of coal at the time, having left Southend on July 14-1940, adding she was bombed aft and amidships at 03.10 pm that day and that 8 crew were uninjured, 2 injured, 4 killed. After the fire had been extinguished, Balder was taken in tow to Dover by the tug Lady Bassey and repaired enough to where she could sail again, then joined the westbound convoy CW 8 consisting of 21 ships on July 25, escorted by the armed trawlers Arctic Pioneer, Drangey and Amethyst. The convoy was attacked by an estimated 75 German aircraft shortly after departure, and by that afternoon several ships had been sunk. MTB 5 and MTB 6, stationed at Dover as a subdivision of the 11th MTB flotille, rescued many survivors that day. When passing Dungeness that same night German E-boats attacked, but Balder escaped these attacks unharmed and arrived Portsmouth on July 26 - again, see Page 1. Broadhurst (sunk by E-boat), Corhaven (sunk), Grønland (Commodore vessel, damaged, later sunk in air attack in Dover on July 29), Henry Moen (sunk), Hodder (damaged), Leo (sunk), London Trader (sunk), Lulonga (sunk), Newminster (damaged), Polgrange (sunk), Portslade (sunk), Summity (damaged, beached at Dover), Tamworth (damaged), Mistley, Jolly Nights, Dominence, Surte, Sanfry, Arthur Wright, British Scout. As will be seen when following the link to CW convoys in the table above (based on A. Hague's database), the list of ships in CW 8 differs slightly from what I've given here (source at the bottom of this page). The last convoy Balder is listed in, together with Rolf Jarl, is PW 459 in Jan.-1944, but she broke down on Jan. 11 and fell out of the convoy. Balder's voyages in this period are shown on Page 8, which says she arrived Falmouth on Jan. 15, proceeding to Stranraer the next day, with arrival (in tow) Jan. 19 (Page 9). She was subsequently used as a training ship for frogmen in preparation for the first phase of the Normandie landings, and continued to be used as such until the spring of 1946. More information on the other Norwegian ships mentioned on this page can be found via the alphabet index below, or go to the Master Ship Index. Sold in March-1946 to Cristos Pappas & Athanasios Coumandareas, Panama and renamed Cape Matapan. Sold in 1947 to China Maritime Trust Ltd., Shanghai, China, renamed Pei Ching. Sold in 1951 to Pacific Union Marine Corp., Panama and renamed Northern Phoenix. Deleted from registers in 1956. OB (& OA) convoys - OA 169 part 1 and part 2 are included. Back to Balder on the "Ships starting with B" page. Norway had previously had another Balder, delivered in Nov.-1882 to Johan Chr. Gjertsen, Bergen, 485 gt. This ship sank in the North Sea on Aug. 31-1898, voyage Drammen-Gt. Yarmouth. The text on this page was compiled with the help of: "Nortraships flåte", J. R. Hegland, "Calamity Corner - The Wrecks of the Eastern English Channel", Anthony Lane - and misc.